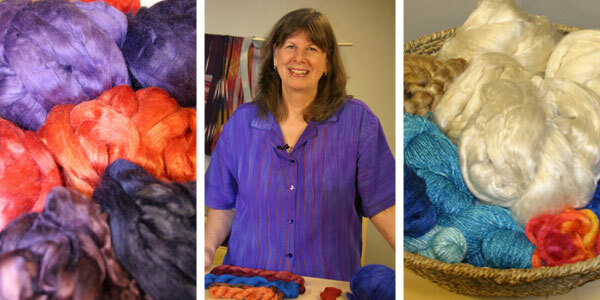 Join Sara Lamb in this HD video download workshop as she explores spinning silk. 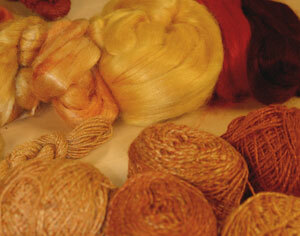 She will demonstrate spinning and drafting a variety of silk preparations plus dyeing your finished yarn or projects. Sara Lamb loves to spin silk--and she loves to knit and weave the fine slick fiber too. Sara helps her students create stunning silk yarns, in spite of the conventional wisdom that silk is difficult to spin. From years of experience, she has developed methods of spinning silk yarns painlessly and with spectacular results. From classic Bombyx brick to uncommon African silk laps, a wide variety of silk types and preparations can be transformed into smooth, durable yarns with glistening surfaces using her techniques. Spin all types and preparations of silk. Draft even the slickest silks easily. Spin enough fine yarn for a project without strain or fatigue. Ply and finish yarns for maximum luster and durability. Choose the right silk for your project (and avoid problem fiber). Spin silk blends with success. Use your spinning wheel or drop spindle for maximum efficiency. Plus bonus content! Learn to dye silk by handpainting the yarn or finished product. Sara's guidance brings gorgeous silk yarns within reach for spinners from advanced beginner to expert. Spinning Silk is available as a 2-disc DVD set, a standard definition video download, or a high definition video download.